When you decorate with these luxurious oiled bronze switchplates and outlet covers, you can create a feeling of old world elegance or modern sophistication. With their smooth finish and solid American-made construction, these refined oil rubbed bronze light switch covers exude sophistication and will be a handsome reflection on your sense of style and appreciation of quality. With more than 60 sizes in the collection, you'll find every configuration you need to make your home look its best. 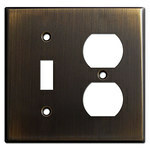 Do I need to replace my white switches when I replace my old switch plates with these decorative switchplate covers? 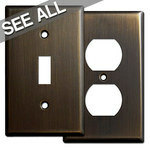 The deep, rich finish of these oil rubbed bronze wallplates will be a stark contrast to your white switches. We don't recommend pairing these elegant plates with bright white devices, but instead recommend a coordinating color such as ivory or brown. You can save on shipping if you buy new ivory switches or brown devices when placing your switch plate order. When you go to install your new cover plates, you'll be so glad you planned ahead and ordered matching electrical devices - it makes all the difference! How do I know if these wallplates will match my current fixtures? We recommend ordering one plate first if trying to match other manufacturers' oil rub finishes. Note: There can be slight color variations between production batches. Also, there tends to be some variation in what is referred to as "oil rubbed bronze" with some brands having more of a reddish undertone and some more of a goldish undertone. These have a goldish undertone. 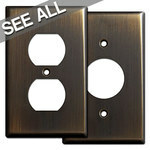 What is the finish on these oiled bronze light switch covers? 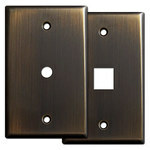 These elegant decorative wall switchplates are made from heavy .040" solid brass, U.S. Bureau Standards Symbol #20, with an antique relieved rich bronze finish that has been lacquered to prevent oxidation. Is there obvious graining on these wall plate covers? 1 and 2 gang oiled bronze plates have a vertical grain pattern; 3 gang and wider cover plates have horizontal brushing. Where can I find screws to match these wall plates? Matching screws are included with each individual switch plate. My bathroom has been remodeled with Venetian Bronze fixtures. 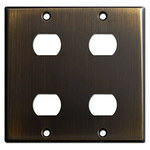 Do you have any Venetian Bronze switch plates? 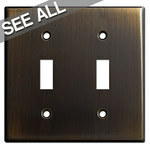 Yes, we do stock a limited number of sizes in Venetian Bronze switch plates with their more pronounced reddish tone. 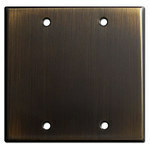 For hardware with a traditional golden undertone we recommend our Oil Rubbed Bronze switch plates. No matter which finish you select, both are gorgeous and are a generally good match for fixtures and faucets in a Venetian Bronze finish depending upon the brand. I'd like to switch out all the ugly gold hardware in my home when we remodel and want to go with something that looks fresher and modern. I've decorated in an "Old World" style and painted the walls tan, would you recommend that I go with these oil rubbed bronze wall plates? Oil rubbed bronze is by far one of our most popular finishes, second behind satin stainless steel. It would most certainly compliment your Old World style as it looks slightly aged and would compliment your decorating style. These oil-rubbed bronze switch covers would also go well with Western, French Country, Rustic, Mission, and Traditional furnishings. 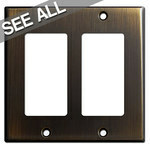 I've heard that oil rubbed bronze is a very trendy finish for switchplates in luxury homes. I'd like to replace all the outlet covers in my home for a more custom look however don't know if I can afford it. Do you have any tips? Many customers who are worried about the cost of upgrading the wallplates in every room could opt to just replace the visible ones and save on the cost by not swapping out switchplates which are hidden behind furniture. Also, besides luxury homes, this particular finish looks great in cabins, bungalows, antique stores, ranches and wineries. The counter top in our new home is made of Verde Austral granite. Do you think these oil rubbed switch covers will look tasteful with our counter top? Yes, this finish is our number one choice for customers who are remodeling their home, upgrading their kitchen or switching out existing wall plates. This collection has a hint of gold, green and brown so it should blend in well. Oil rubbed bronze wallplates also look stunning when paired with Tropic Brown, Carioca Gold, Conquistador Beige or Betchouan granite countertops. Can I install oil rubbed switch plates in just my dining room and kitchen? 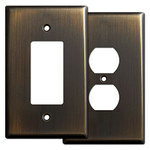 You can choose to upgrade your current switch covers to this finish in any room you'd like. Generally, customers who decide to replace some often come back to order more for each room in their house. This way, your switch plates will be uniform and match all throughout your home including your living room, foyer, bedroom, office and bathroom.